NOOOO! THe season is over! THIS IS HORRIBLE! I CAN'T LIVE WITHOUT THIS SHOW ANY MORE! This scares me. More then cupcakes did. Though I've seen worse from the internet, so I was a bit desensitized to cupcakes. 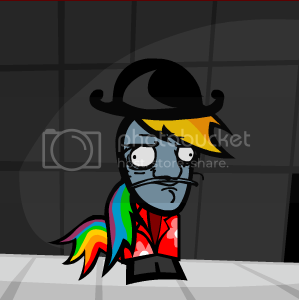 Rainbow Dash in a bowler, and a Hawaiian shirt, likes this thread. sonic rainboom. Just saw it. It was...perfect. That's my favorite episode. Not only is it about Rainbow Dash, but it's also a reference to the story of Icarus. so anyone wanna answer my question ? ... The answer is on page 1, bro. Uh oh!!! Have you kids been bad? I loved the series aaaaaaaaaaaaaaannnnnnnnnnnndddddddddddd there is another season planed. Sci-fi fans felt the same way about furries 20-30 years ago. Wow, for a fandom that's supposed to be all about friendship and acceptance, the MLP fandom does seem to have its dark side, doesn't it? 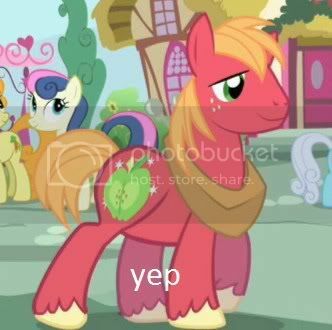 I've been trolled by a brony for not liking their....more sensual stuff of a particular pony that the honorable Sir Renard thinks is homosexual. Also, someone on another forum posted a picture that I instantly loved. I wish I knew who drew it. Rule 34. Not justified by any means. But in other news, who is excited for Season 2 with more Luna and Derpy?!?! I am so in love with that picture. This obsession is officially not allowed to die until a Liam Neeson pony is made. This I declare, and thus it shall be so. Go back to watching pony videos. NOW. I must have that Liam Neeson Pony!